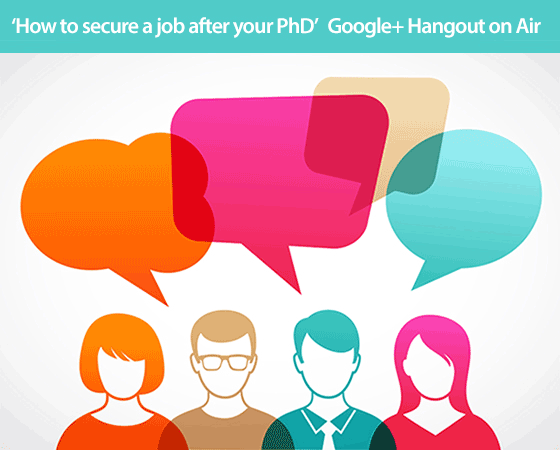 jobs.ac.uk organised a live video Q&A on the subject of 'How to secure a job after your PhD', you can watch the recording here. Our Google+ Hangout on Air was hosted by Aimee Bateman, founder of Careercake.com. Aimee is a successful speaker, business ambassador and recognised employment expert. The panel of experts included Dr Chris Humphrey, founder of Jobs on Toast, a blog dedicated to helping masters, PhD and post-docs students find fulfilling careers outside of academia. Clare Jones, a senior careers advisor from Nottingham University and Dr Ioanna Iordanou, a PhD development co-coordinator from Warwick Business School and last but not least Dr Nadine Muller a Lecturer from Liverpool John Moores University. If you haven't got time to watch the video, you can read a summary of the event here. How do you convince non-academic employers that you are not overqualified? Should I leave my PhD off my CV when applying for non-academic jobs? Publications Vs Teaching Experience - which is more important for securing a lecturing post? I need to pay the bills! Do I get a temp job after my PhD? How do I balance studying with job hunting? Have you seen our other videos?